In the mist of glory: plump, line-free skin. 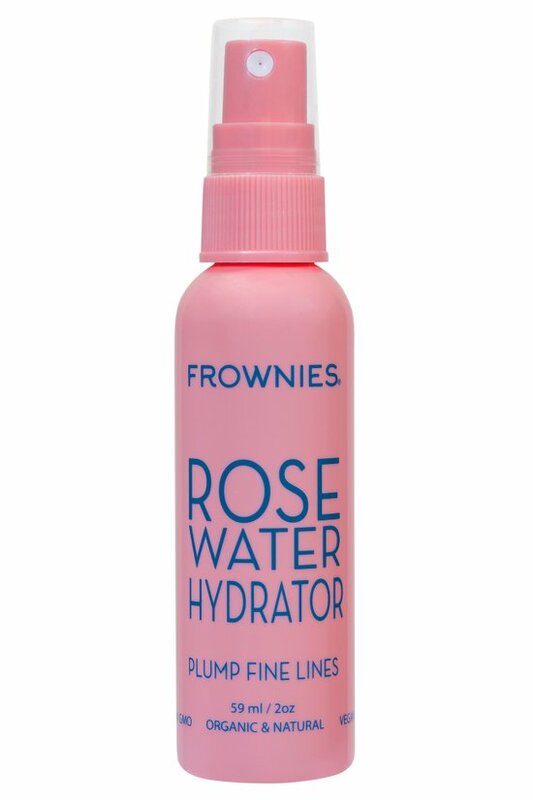 This rejuvenating spray from Frownies® mists parched skin with instant refreshment. Ultra-hydrating with rose water and hyaluronic acid, it plumps skin, erases wrinkles and reduces pore size leaving skin so youthful and fresh. For advanced anti-aging, use a spritz to activate the age-reversing properties of Frownies® Eyes & Mouth Facial Patches (09178) and Forehead Facial Patches (09177). Spray on back of Frownies Facial Patches to activate adhesive and enhance benefits or spray on entire face for a daily refresher. Aqua, Rose Hydrosol (Rose Demascena Flower Extract), Organic Aloe Vera (Aloe Barbadensis), Propanediol, Hyaluronic Acid (Sodium Hyaluronate), Aspin Bark (Populus Tremuloides), Vitamin E (Tocopherol), Rosewood Essential Oil,Comfrey (Symphytum Officinale Leaf), Citrus Reticulata(Tangerine). A favorite in Hollywood for over a century, this all-natural, non-invasive wrinkle eraser delivers the smooth, ageless results without the cost, needles or toxins of doctor's procedures. A simple patch, activated by hydrating facial mist or water, Frownies re-educate underlying facial muscles to relax and naturally fade wrinkles and expression and frown lines. Wear overnight and wake so refreshed and rested looking!